One of the four original citrus fruit, the citron (Citrus medica) boasts as many health benefits as the mandarin, papeda and pomelo. Not only does it possess great antioxidant value, but it also exhibits antibiotic, anti-inflammatory and pain-relieving properties. 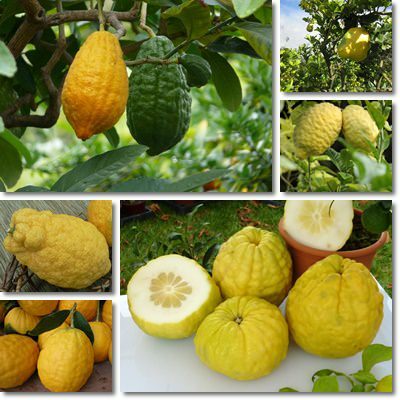 The citron is believed to have originated in Southeast Asia, from where it spread to the Mediterranean basin. It predates most other citrus fruits and records suggest it was being cultivated as far back as 3000 years ago. Citrus medica is a small, evergreen tree which grows to about 2-5 meters in height. It has pleasantly fragrant leaves that give off a strong lemon odor. Flowers grow in clusters and differ in color depending on the variety: sweet citron varieties tend to have white-yellowish flowers, while acidic varieties are purple-colored. The tree is also highly sensitive to frost, limiting its cultivation to warmer regions. What does citron fruit look like? The citron is usually elongated or egg-shaped with a thin rind of yellow color. Unripe citrons are bright green, similar in color to limes. The fruit can grow to impressive sizes of up to 4-5 kg and 30 cm in diameter when fully mature. The rind of the fruit is furrowed or, in the case of some varieties, ribbed or even slightly bumpy. Citrons look a lot like lumpy, over-sized lemons. Buddha’s hand is a fingered citron variety known as such due to the fact that it resembles a hand with fingers, either opened or closed. Unlike other citrus fruit, the citron has a rather thick pith (the white inner part of the rind) and very little pulp (some varieties of the fruit have none, such as the Yemenite citron). The thick, predominant spongy white rind is also the biggest difference between citron and lemons and the easiest way to tell the two apart when you have citrons that look a lot like lemons. The fruit usually contains a lot of seeds which are either colorless or white with a darker interior. What does the citron fruit taste like? There are three varieties of citron: sweet, acidic and bitter. Sweet citrons have a lower acidic content and are thus sweeter. Varieties include the Moroccan and the Corsican citrons. Acidic citrons are those with a high acid content. Varieties include the Balady, Greek, Diamante and Florentine citrons. Pulpless citrons, such as the Yemenite citron, have no pulp, just a lot of bitter pith (see other citrus fruits here). 1) Excellent natural pain reliever. If you have a headache, drink a glass of water with some freshly-squeezed citron juice. Citrons possess anti-inflammatory and pain-relieving properties which should make your headache go away naturally. What helps treat minor headaches and even tension headaches is the vitamin C in citron. In larger amounts, vitamin C can reduce arthritis pain and inflammation and improve joint mobility and life quality. 2) Natural diarrhea and constipation treatment. The thick white pith from underneath the rind is a rich source of pectin, a type of soluble dietary fiber. Pectin is known to help combat diarrhea and constipation and, as a result, the pith can be consumed for this purpose. Common preparations include ground citron rind, candied citron rind and citron jam. The pulp can further help with diarrhea because of its astringent properties. 3) Good for colds. Seeing they are rich in vitamin C, an incredibly potent natural immune system booster with antibiotic-like properties, citrons help prevent and reduce the severity of respiratory infections such as colds as well as speed healing. Just add a few drops of juice to a cup of tea that has reached room temperature. The reason you should allow the tea to cool down is because heat destroys vitamin C and its beneficial properties. 4) Offers anticancer protection. Citrons are a rich source of potent antioxidants such as vitamin C, a nutrient shown to drastically reduce cancer risks. Eating fresh vitamin C-rich foods such as citron can contribute to better health and cancer protection. Moreover, the albedo or the pith (the white part in between the rind and the pulp) has been shown to contain impressive antioxidants as well, further supporting the anticancer effects of the fruit. 5) Maintains healthy teeth and gums. The generous amounts of vitamin C in citron pulp contribute to teeth and gum health as well and help prevent the dreaded scurvy, provided the fruit is consumed fresh (cooking heat destroys vitamins). However, the acidity of the fruit may, in time, damage teeth enamel and cause teeth sensitivity (more information in the article Why warm lemon water is bad for you). 6) Promotes cardiovascular health. Citrons were shown to contain good amounts of potassium and magnesium, two dietary minerals of unimaginable importance for the prevention of cardiovascular disease. While magnesium maintains the health of the heart muscle, potassium helps regulate blood pressure, counteracting high sodium levels and lowering high blood pressure, promoting cardiovascular health. 7) Useful for insect bites and small cuts. Citron fruit and leaves give off a strong lemony odor which easily impregnates clothes. While it is pleasant for us, the smell efficiently repels mosquitoes, moths and other insects. Rubbing a couple of drops of citron juice onto a mosquito bite is said to help reduce the itching sensation. And if you add a few drops of juice to a small cut, it should help stop the bleeding almost immediately. 8) Natural remedy for bad breath. Citron pulp, juice, extract or seeds are believed to help improve bad breath naturally. However, because bad breath is often but a symptom of an underlying medical condition, this is only a temporary solution. Because of its high vitamin C content, citrons were used in the past to treat seasickness, scurvy, nausea and vomiting. Moreover, they were recommended for the treatment of skin diseases and hemorrhoids. The scientific explanation for this is that vitamin C contributes to maintaining skin and blood vessel integrity and thus helps skin heal and prevents hemorrhoids, which are essentially swollen blood vessels, from bleeding. Citron essential oil, made from the rind of the fruit, was believed to possess potent antimicrobial and antibiotic properties and would be employed for external use in various therapies. Side effects of citron. The acidic pulp is bad for tooth enamel and can irritate the stomach lining which makes citron bad for teeth sensitivity or stomach problems like gastritis or acid reflux (find out more about what foods to eat and to avoid for acid reflux). Conclusion. While it may be just a dry citrus fruit, often too acidic or bitter to be worth eating, keep in mind that citron is an incredibly healthy food that brings about many wonderful health benefits. The acidic pulp, the chewy white pith and even the rind holds great uses and help with a variety of health problems. Just know that regular consumption of citrus fruits, which are acidic, can damage tooth enamel over time and upset gastritis. Marius Lixandru on How Many Eggs Should You Eat per Week? Anonymous on How Many Eggs Should You Eat per Week?